Bridal Shower Bingo is played just like a game of regular bingo except the squares are filled with wedding-related words instead of simple numbers. We include 25 unique cards so that an entire group can play without having to worry about two people having the same card and getting BINGO at the same time. This is a FREE and fun game for the wedding shower guests or can be played at other wedding events to lighten the mood. 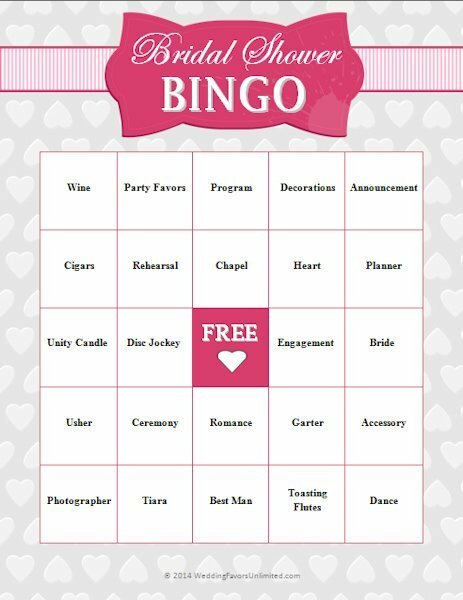 You could offer food-related bingo prizes or gifts within the theme of the wedding which are available to purchase here on our site at Wedding Favors Unlimited. Squares include “Unity Candle”, “Engagement”, “Romance”, “Toasting Flutes” and more! This is an all-ages friendly game, so it’s perfect if you have younger children attending the party and need a way to keep them entertained along with the rest of the guests. The twenty-eight page download comes complete with the rules, a master list to cross the items called off as you go, and all the cards you will need to play the game. Print the game out on thicker paper to give a more professional feel to the guests and prevent daubers from marking up the table underneath. All you have to provide is something to mark off the squares with (like daubers or markers) and prizes. Make sure to check out our other FREE bridal shower downloadable games! Download the Bridal Shower Bingo Game today for some wedding shower fun for the whole party!